An easy week for this series; not an easy week as for the Board of Education as they begin the real budget toil with a Workshop (no public testimony) session at 5;30 Monday, March 15, in room 103 of the Doyle Building. 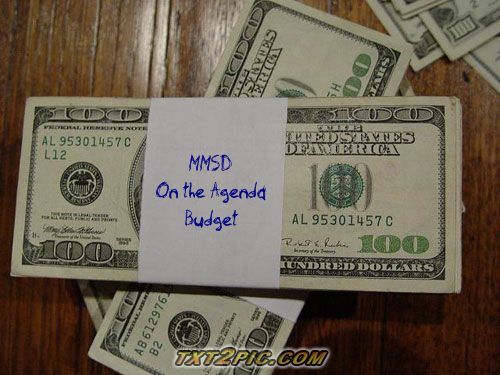 Nothing else on the agenda Like almost all Board meetings, this will be carried by MMSD-TV. The full schedule of Madison Metropolitan School District meetings is posted here. Other meetings include an Executive session of the Board (Monday, 5:00 PM) two $-Year-Old Kindergarten sub-group meetings (Logistics, Monday at 1:00 PM and Assessment, Wednesday at 10:00 AM) and another new one for the posted meetings, the Title VII Indian Education Parent Committee Meeting (Wednesday at 6:00 PM). Like the Board (from what I hear), I’m still working my way through the budget information. The district has posted a version of the Citizen’s Budget, which maybe a useful introduction for many. As noted previously, the Board questions and administration answers are being posted in near real time. It is hard to say what the Workshop will be like. The listed items indicate that there will be lots of exchanges of information among the Board and between the Board and the administration. I”d guess the Board will be feeling each out about many items on and off the cut list. The agenda says “action may be taken” on the Budget Options. If action is taken, most likely it will be to remove things from consideration (like closing schools). The one sure thing is they will also be discussing the format for the next Workshop (on April 5th). That’s the last item on the agenda. To close, I’m just going to cut and paste a suggestion I made earlier this week. As the budget process goes forth with one option on the table being refinancing to put off about $4 million in payments — Budget Option 188, (Tier 1) — , and others such as the Reorg involving spending fund equity, I think it is essential that early on there be a full discussion of the advantages and disadvantages of these approaches in the long and short term, including a review of what has and has not been done in recent years in these areas. I asked for this last year too and it hasn’t happened.